Well, says Beel, Texas is known for leaving no child behind. Evidently that has morphed into leave no issue behind. Texas State Senator Larry Taylor, whose district includes Galveston, has filed a bill that seeks to outlaw the buying and selling of shark fins in Texas. According to a report by StateImpact, the bill is before the Texas Senate Natural Resources Committee, which has been hearing testimony on this issue. Also testifying in support of the bill was Kayla Ellis, a senior at a Dallas-area high school, who showed that shark fins are actually on the menu at some Texas restaurants. Ms Ellis testified, “One case that I found I asked if that had shark fin dumplings, at Maxim’s Restaurant [in Dallas]. The hostess immediately became edgy and asked me to leave. I later had my friend that speaks fluent Chinese and they told her they did in fact sell shark fin dumplings.” No, Beel did not misquote Ms Elllis. 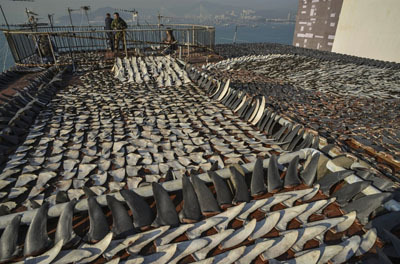 Ms Ellis further stated that shark finning is popular among poachers because of the high price for the meat, and you can fit a lot of fins onto a boat (the shark carcasses are simply thrown back into the sea). So, as Beel follows Ms Ellis’s logic, she believes either that shark fins are composed of muscle (they aren’t) or that the shark meat is valuable and, therefore, is thrown back into the sea. Hard to be sure. There was no testimony against the proposal. Good thing, says Beel, it wouldn’t be too hard to out talk these folks. Anyway, armed with half-baked information such as this, the Texas Senate surely has more that it needs to act. Beel expects the bill to pass. The bill wouldn’t ban shark fishing in Texas, anglers would still be allowed to catch and keep one shark per day. Entire shark carcasses could still be sold. The bill would only prohibit possession of shark fins with intent to sell, making it a Class B Texas Parks and Wildlife misdemeanor. So if a angler wanted the fin for his or herself, that would be allowed by the proposed law. So sharks and be caught and killed. The whole shark can be sold. But the fins cannot be sold separately from the carcass. Now that’s tightening the screws! The penalty for a Texas Parks and Wildlife misdemeanor is a fine of US$200-$2,000 and or a jail sentence, suspension or revocation of fishing and hunting licenses for up to five years, forfeiture of gear used to commit the violation, and civil restitution. So the penalty is potentially severe. However, as is the case elsewhere, Beel expects fishing violations to be punished with lighter, rather than more severe, fines and sentences. This entry was posted on March 6, 2013 by denstormer in Commentary, Conservation, Fishing and angling and tagged fishery management, marine fish, sharks, USA.